How effective is the Mexican government’s ‘kingpin strategy’? Knights Templar kingpin Servando “La Tuta” Gomez was finally captured in Morelia last Friday. Mexican security forces captured the heads of two of the nation’s most feared and violent drug cartels in the last week, but security experts remain unconvinced of the effectiveness of the government’s strategy in the war on drugs. For every capo the government brings down, several more spring up in his place like the snarling heads of a Hydra, while the cartels’ finances and the shady figures that protect them remain untouched. This week’s arrests were the latest in a string of recent detentions and killings of key figures within the pseudo-religious Knights Templar cartel and the ultraviolent paramilitary group Los Zetas. First, just as he was preparing to tuck into a chocolate cake to celebrate his 49th birthday, Servando “La Tuta” Gómez, the last remaining figurehead of the Knights Templars, was arrested in Morelia, the capital of the western state of Michoacán, last Friday. 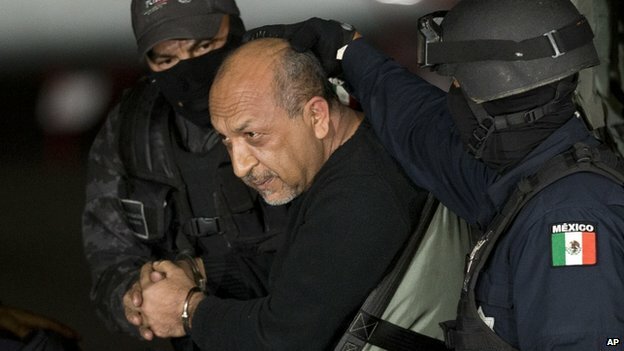 Then, early on Wednesday morning, Los Zetas boss Omar Treviño Morales was captured in a wealthy suburb of the northern city of Monterrey. The Enrique Peña Nieto administration boasts an excellent record of bringing down Mexico’s most infamous gangsters, having also arrested almost all of the most prominent leaders of the Sinaloa, Gulf, Juárez, Tijuana, Beltrán Leyva and Guerreros Unidos cartels. Most notably, the government recaptured Joaquín “El Chapo” Guzmán, the world’s most wanted drug lord, 13 years after he escaped from a maximum-security prison, in February 2014. Most notably, the government recaptured Joaquín “El Chapo” Guzmán, the world’s most wanted drug lord, 13 years after he escaped from a maximum-security prison, in February 2014.,,, did you mean 2004? Thanks. I meant to say he was recaptured in 2014. He escaped in 2001.